A 10oz CO2 unit is set into the a plastic sleeve in the foam of the inside of the board and can be activated by turning a knob marked "FIRE" on the top of the board. 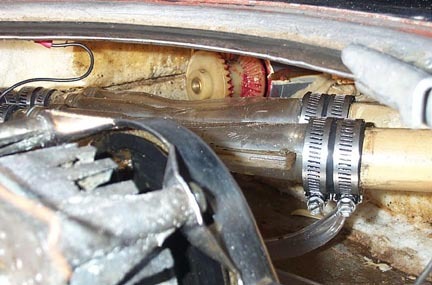 It is a strange system where turning the knob actually rotates the canister valve, and the canister itself and floods the inside of the board with CO2 which will not support combustion. Apparently the Coast Guard still consider this an acceptable way to deal with on board fires so the board can be licensed in California! 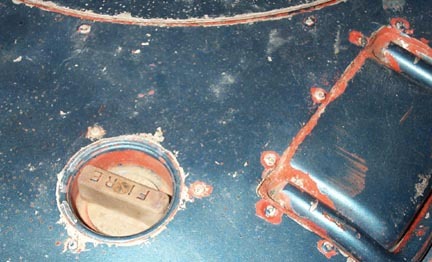 Below is a shot of the fire extinguisher twist knob set in the deck just near the inegral carrying handle. 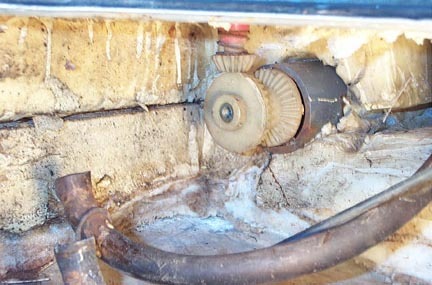 Below is a shot of the canister greased up and installed behind the first attempt at the sump system.